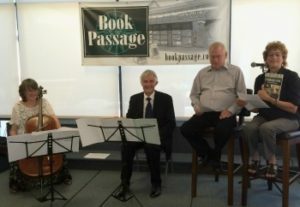 At a recent book event: Giving Voice to the Victims of the Nazis, an audience member asked Rudi if writing our novel Stumbling Stone and telling the story about his Uncle Gerhard had helped Rudi find closure and create a sense of healing. Part III of Stumbling Stone, a novel based on our true life stories, is about Gerhard, a young German who was a victim of the Nazis. His brother (a character based on Rudi’s father) was a high ranking Nazi and his father was a police official who was also a party member. Rudi explained that initially, he wasn’t searching for anything or looking for closure. But he does think about why he came to America when he was 21 years old. Was he fleeing from a society where you don’t know anything of your past? Fleeing from his family where everything about the past was shrouded in silence? Writing the book brought questions he had never considered before. At the event, into the silence, as the audience digested Rudi’s words, stepped Friedrich Edelmann, who organized book reading/concert to give voice to forgotten victims of the Nazis. A bassoonist with the Munich Philharmonic for 27 years, Friedrich had suggested that we combine our story with the music he and his wife, cellist Rebecca Rust, selected. Rebecca is an American-born Jew, now living in Germany. Some of it was music by Jewish composer Hans Gál, a German Jew who fled the Nazis and whose music has been largely overlooked. Friedrich said, “This event is an obligation. When you live in Germany, you are confronted with this problem every day – how to deal with the past. In Germany, the past is always questioned; in the United States, not so much. We wanted to do this event here in the U.S.. It’s an obligation to keep the memory, the discussion alive. Still, we discuss the past every day: How could it (the rise of the Nazis and the Holocaust) happen? How can we talk about it? Friedrich explained that his childhood was alike, and then in some ways different from Rudi’s. “We never talked in my family (about the past) but my father gave me Anna Frank’s diary. We were not visited by old Nazis. It was a different atmosphere. We never talked about it. He said he and his siblings wonder what their father thought after the war was over. “It was silent and it will remain that way,” he said.